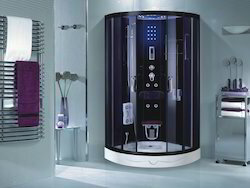 Product Quality & Exclusive DesignThe unique range of steam Shower cabins is manufactured from high quality materials throughout,with attentive workmanship applied to the entire assembly process. By buying direct without any middle man, Steamers India is able to provide good value for money withoutcompromising on quality. All of our steam showers are influenced by European design, so you can ensure maximum "wow factor" with a Steamers India product. *Low pressure water supply may require a pump.